Unfortunately, many persons have not received and will not receive adequate compensation for their traumatic brain injuries because they did not have proper representation. A lawyer representing a person and their family for traumatic brain injury should possess knowledge, education and experience in this area of litigation. In most states, injured persons have the ability to retain a lawyer by the use of the contingent fee agreement. The lawyer does not receive any fee until the conclusion of the case. Under this system, an injured person and their family can afford to retain the most qualified legal representative. Since the results of your law suit will have important and long term impact upon the quality of your life, it is important to determine who the best lawyer is for your brain injury case. Q: How many cases similar to mine have you been involved with as the principal attorney over the past three years? Q: What percentage of your practice is devoted to representing persons with a traumatic brain injury? Q: Will you be handling my case personally or will you be referring it to another lawyer or law firm? Q: What have been your results in representing persons with cases similar to mine? Q: Have you written and published any articles on traumatic brain injury? Q: Have you lectured to any bar associations, brain injury associations or other groups about the effective legal representation of persons with traumatic brain injury? Q: Do you actively participate in your state’s brain injury association? Q: Do you regularly attend conferences and read textbooks and articles about traumatic brain injury? Q: Have you ever received any professional honors and awards concerning your representation of persons with a brain injury? Q: Does your law firm have the financial resources to advance, even if in excess of $50,0000, to properly prosecute my case, if necessary? At De Caro & Kaplen, LLP, we concentrate our practice on representing persons with brain injury. We have achieved verdicts and settlements in brain injury cases totaling over 100 million dollars. Michael Kaplen and Shana De Caro will personally handle your case. Our attorneys have lectured to brain injury associations, lawyers groups and medical associations on brain injury. We have authored articles and have received many awards and honors in the area of traumatic brain injury. 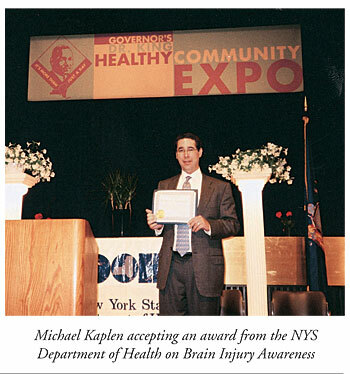 We are proud that our founding partner, MICHAEL KAPLEN is now in his third term as President of the Brain Injury Association of New York State and has been appointed by the Speaker of the New York State Assembly as his representative on the New York State Traumatic Brain Injury Coordinating Council.